People are living longer, and health care is getting more expensive. These are two current realities that most future retirees are at least aware of. But understanding how the two are related and the important retirement challenge they present requires focused investor education and a proactive approach to saving. Experts suggest targeting a retirement income equivalent to 70%-80% of working income to sustain a lifestyle similar to that of an individual’s working years. This estimate assumes that large expenses such as a mortgage or college funding are no longer a factor. What may be missing is the dramatic and increasing portion of income that will be needed for health-care costs for each year spent in retirement, which are currently projected to increase at over 5% annually. Longevity and health-care costs complicate retirement calculations because they present such a wide range of potential outcomes. For individuals who are still in good health at age 65, life expectancy is significantly higher than it was at birth; 87 for men and 89 for women in the United States. 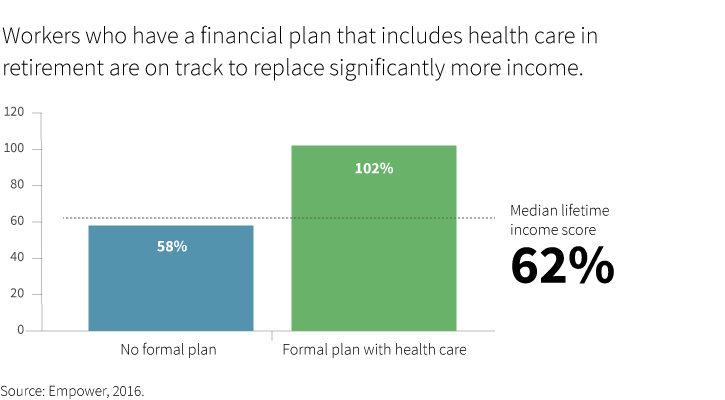 * Health-care costs also vary widely and must be figured as averages from a range of possible outcomes — some individuals experience very high expenses, and others much lower. Healthy individuals ultimately have higher costs in retirement than individuals who are in poor health because their longevity is a greater driver of costs than shorter-term illness. Providing health-care cost estimates in tandem with retirement savings calculators allows savers to better see how much they need to save and to plan accordingly. Saving more before retirement, due to compounding of returns, is less expensive than paying costs as they occur in retirement. Retirement plan providers can partner with plan sponsors to educate plan participants about projected long-term health care costs. This would help to give future retirees a realistic model for estimating expenses in retirement. Participants should be encouraged to save enough, early enough, when compounding can help make it easier to cover future costs. *Healthview Services, 2017 Retirement Health Care Costs Data Report.